Damascus countryside, SANA – Units of the Syrian Arab army discovered on Sunday a network of tunnels and trenches left by Jaish al-Islam terrorists linking Mesraba, al-Shifonya and Douma, while combing the farms surrounding Douma in Eastern Ghouta. Speaking to SANA’s reporter in Eastern Ghouta, a number of field commanders said that units of the Syrian Arab Army operating on the east and west directions of Eastern Ghouta carried out special and concentrated military operations, and waged several battles in fortified areas, underground, across Barada River and sewage system, as well as fighting in cities. The commanders went to say that in the last two days, the Army units managed to penetrate the first and second defensive lines of Jaysh al-Islam terrorists in Douma area to move eastwards, adding that the terrorists established a main tunnel extending from 4 to 5 km, and divided into sub-tunnels, each of them is about 600 meters in length equipped and linking them to their dens, barricade and combat lines. 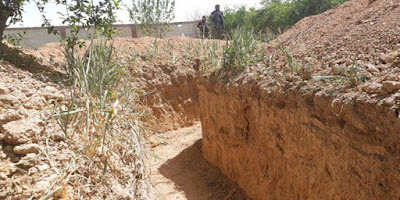 The Army units found a big tunnel left by terrorists stretching from the farms towards Douma, which is 6 meters high and 15 meters wide, the field commanders said. They explained that the tunnel was used by the terrorist as a garage for the heavy machinery and to prepare the cars bombing, pointing out that the engineering units blocked the tunnel and blew it up with iron barricades to prevent the infiltration of the terrorists.